I admit: I was sold early on Sicario. Were you? There’s no shortage of seduction. Emily Blunt leads a stellar cast that includes Josh Brolin and Benicio Del Toro in some of the finest roles of their respective careers; Roger Deakins (blame him for this) is behind the camera, which is hardly ever wrong; and Denis Villeneuve is in the director’s chair, following up on Enemy and Prisoners with another intense thriller. Not completely onboard yet? 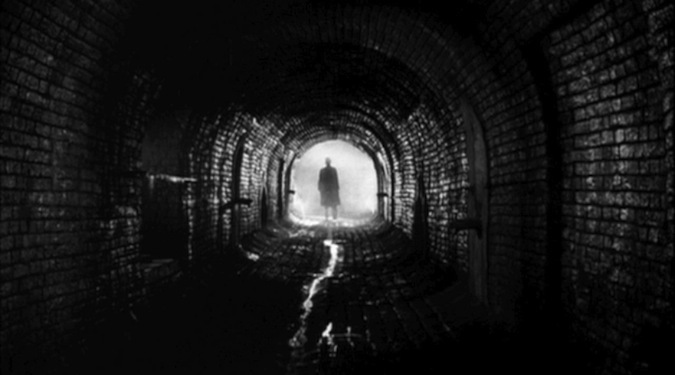 How about a poster that recalls The Third Man? Ah, works every time. 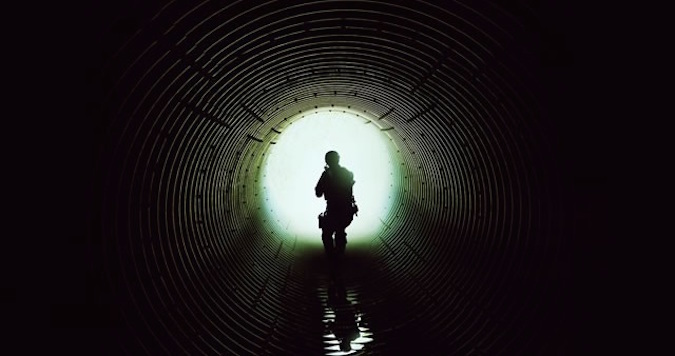 Happily, as we sit down in the darkened theater and Sicario (a film which by the way has little to do with The Third Man) begins, it turns out the theme of seduction was at the heart of the film all along. After Emily Blunt’s task-force leader Kate Macer uncovers a horrific mass grave linked to Mexican drug cartels on U.S. soil, it’s fairly evident that the efforts of the squad are meaningless in the face of the sheer will of the cartels. She’s soon recruited by Brolin’s Matt Graver, a nonchalant “DoJ advisor” who has his own plans of attack involving his “bird dog”, Del Toro’s mysterious Alejandro. What follows is a dark look at the drug war; as Grantland‘s Chris Ryan points out in his stellar review, it’s a version of the tale we’ve never had until now. Ryan’s review parallels Sicario with Apocalypse Now, and it does so in a way that makes that comparison more than just blind praise. But he also mentions how Kate is “always looking for reference points”, an insight deserving of some expansion for the ways in which it informs the theme of seduction. Kate seeks rules, regulations, by-the-bookness, but she also seeks literal and physical reference points throughout the film. On the first mission to Juarez the caravan moves single-file through the sandy streets and border crossings, and a single spotter vehicle appears one block over. It shadows the convoy for one block, two…and then on the third it’s gone. Vanished. Kate, who had been keeping one eye on the spotter car, instantly loses her reference point. This happens again and again, and Kate — who repeats “what are we doing here?” several times — keeps seeking familiarity within a specific set of laws. “The boundaries have moved,” states a governmental superior at one point. This is nearly incomprehensible to Kate: that the cartels who disregard the law are now being brought down by cops and military agents who disregard the law. What’s the difference? Where’s the boundary that divides those two? Once that boundary moves, it might be difficult to find again. And yet the finer Hurt Locker point in the context of this drug war film is just that: war is a drug. As Matt Graver recruits Kate early in the film, special note is made with regard to how Kate can join up. She can’t be appointed or assigned to the squad, but rather has to volunteer. Once out with the squad even threats of “tell me or I walk” don’t sway Graver, and Kate doesn’t act on them. Part of her is thrilled by the lack of boundaries, by the way in which fighting fire with fire can actually produce results. She’s continuously seduced by the darker operations of war, and in one of Sicario‘s best scenes she’s even literally seduced by one of the “bad guys”. Graver represents the zenith of that seduction. He’s fully enraptured by battle to such a degree that it’s become recreation. For Graver the cartel dealings are just an excuse to “dramatically overreact”, to cause chaos outside what most would deem to be acceptable boundaries. His contrast with Alejandro is clear, as the latter is on a mission of revenge. Alejandro hunts the man who killed his wife and daughter and does the same to him, and then kills him as well. Sicario devotes special attention to a well-meaning Juarez cop who gets killed in Alejandro’s process, just a body along the way from the bottom rung to the top. In doing so, the film poses the question as to whether one man, Graver or Alejandro, is any better than the other. Alejandro might be able to fall back on claims of vendetta, but he wastes innocent life nonetheless. With all of the intentional deception and lack of transparency afoot in Sicario, it’s not even out of the realm of possibility that Alejandro is simply lying. Whether or not that’s true is speculation, but it is true that Graver doesn’t even see the need to fabricate a justification for his actions. He’s relatively honest when it comes to stating “what we’re doing”. Brolin plays him powerfully, too, with a nonchalantness befitting of a man fully at ease with the same methods that make Kate tense up — between this and Inherent Vice, he’s proved himself as competent a supporting actor as a lead. He, Del Toro and Blunt play three individuals surrounded by war, bound by it in different ways despite the flexible nature of those boundaries. One should expect that each of them would have their own perspectives on whether they emerge from that war as winners or losers, and in a way each of them would be right.